24 megapixels, 11fps shooting, 4K video and the best electronic viewfinder the world has ever seen. Interested? The Leica SL (Typ 601) is "a new milestone in professional photography," says Leica. That remains to be seen, but the prestige camera maker has certainly dropped a bombshell. Better known for its exquisitely-engineered but expensive retro rangefinders, Leica has made substantial inroads into the digital market in recent years with cameras like the Leica Q, Leica X, Monochrom and medium format Leica S.
These cameras are expensive (and how) but they are beautifully made and engineered and combine classy, minimalist design with increasingly competitive imaging technology. But the new Leica SL isn't just competitive – in some respects it's taken the lead. The big hitter in the full-frame mirrorless market is Sony, with its A7-series cameras, but although the SL can't compete on price, it certainly can on tech. Viewfinder: 4.4Mp, with "imperceptible latency time"
Individually, these specs (apart from the viewfinder) can be matched or beaten by individual Sony models, but to find them all in a single camera is a real eye-opener. Leica also claims the viewfinder has magnification "reminiscent of a medium format camera", and "the fastest autofocus currently available". These are all things we'll want to test fully for ourselves, though we have been able to use the Leica SL for a few days before its official launch, and you can find out what we think in our special Leica SL hands-on review. The Leica SL will have its own dedicated lens range, and the first to arrive (at the same time as the camera) is a Vario-Elmarit-SL 24–90 mm f/2.8–4 ASPH. The variable aperture (f/2.8-4) will raise some eyebrows, but Leica says the lens is designed to produce excellent performance at all apertures. We can take that to mean that a constant f/2.8 lens would not necessarily produce the consistent quality the designers demand. The size could cause some consternation too. The Leica SL body is no lightweight (it looks like the Sony A7 design, but it's bigger), and the 24-90mm lens is a bit of a monster. It's to be followed by a Leica APO-Vario-Elmarit-SL 90–280 mm f/2.8–4 and a Summilux-SL 50 mm f/1.4 ASPH. 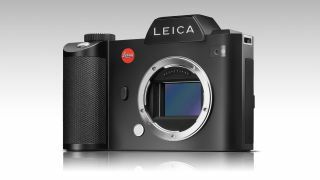 In addition, the Leica SL will be able to use lenses made for the Leica T directly in a 10Mp 'crop' mode, and there will be adapters for Leica S, M, and R system lenses, and lenses from other manufacturers. Leica says the SL is optimized for Leica M lenses, supports all their functionality and is designed to deliver the quality they've become famous for – the extent to which Leica has been able to integrate the SL with its historical lens products is very impressive. The range of SL lenses may be limited initially, but there are adaptors for a much wider range. This paean of praise has to end somewhere, of course, and inevitably it's with the price – though it's not quite as bad as you might fear. Not quite. The Leica SL (Typ 601) body goes on sale at £5,050/US$7,450 (about AU$10,260), while the Vario-Elmarit-SL 24–90 mm f/2.8–4 is £3,150/US$4,950 (about AU$6,820). That is a lot of cash, especially compared to the cost of Sony A7 models – but when you compare it to pro DSLRs, then Leica is not that far out of the ballpark.